There’s a real uncertainty in the early scenes of Spencer Susser’s Hesher; What’re they up to here? I kept asking myself. What are they trying to do? It’s hard to tell if the film is going for black comedy, sociopathic drama, or cheap thrills; by the time it ends, it’s still hard to say. There are scenes that are funny, others that are creepy, and then there’s Rainn Wilson, playing an empty shell of a widower and doing it absolutely straight. It almost feels like Susser and co-writer David Michôd (who wrote and directed the brilliant Animal Kingdom) decided to lock all their wild ideas into a room and let them fight it out. 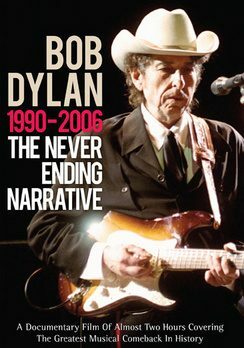 On DVD: "Bob Dylan 1990-2006: The Never Ending Narrative"
We think we know, by now, what we’re getting with these unauthorized music documentary DVDs: interviews with a variety of second and third-tier onlookers, scored to soundalike music, complimented with public domain footage, suspiciously lacking any input from the artist themselves, or any of the actual music in question. Bob Dylan is a particularly hot topic of this sub-sub-genre, the logic presumably being that his followers are so fanatical that they’ll pick up anything with his name on it; a Dylan tribute musician/“filmmaker” named Joel Gilbert has put out several barely watchable examinations of his hero, sometimes even repackaging the same subpar material. The point is, it’s a bit of a shell game out there, which is why Bob Dylan 1990-2006: The Never Ending Narrative is such a nice surprise. It comes to us via Chrome Dreams, an outfit specializing in these releases; they’ve also issued some markedly sturdy U2 releases. Their strategy for standing out from the shady crowd is simple; their films are often made in Britain as news programs, thereby invoking “fair use” copyright rules that permit occasional song and video snippets, and they choose to seek out music writers and commentators rather than hangers-on. The results, make no mistake, are not great documentary filmmaking. But they are far better than what we’ve come to expect from releases of this type.